A shrub to small tree, 1 to 7 metres in height; the trunk may be divided into a few slender limbs; these are further divided into many small branches to form an irregular and even-topped crown. 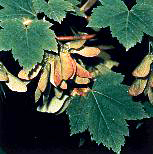 Leaves are 7 to 10 centimetres wide, divided into 3 to 5 lobes, and have a typical maple-leaf shape. They are coarsely toothed, dark green on top and greyish-green underneath, turning bright red-orange in autumn. The fruit consists of a cluster of winged seeds, joined in pairs at a sharp angle in a V-shape. The seed wings are about 2.5 centimetres long, and the seeds are strongly wrinkled and indented. 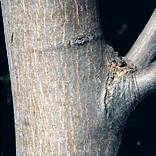 Generally thin, smooth, and dark reddish-brown; roughened on larger branches and old trunks. It is widespread at low to mid elevations throughout most of British Columbia, except in the Queen Charlotte Islands and northern British Columbia. 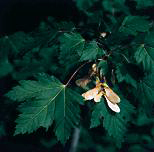 Douglas maple occurs on well-drained wet sites and sometimes in avalanche areas. It inhabits clearings and open forests. 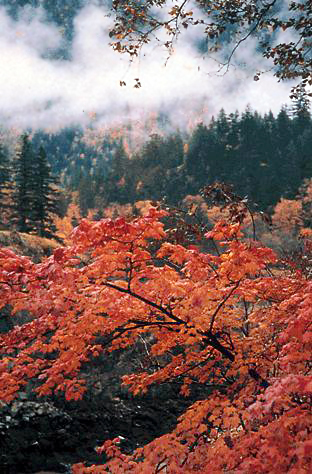 Aboriginal people in the Interior had many uses for Douglas maple. The wood is tough and pliable, and they used it for such items as snowshoe frames, saddle frames, spoons, dipnet or fishing hoops, bows, rattles, masks, and headdresses. They soaked the green wood and heated it, then molded it into the desired shape. The Thompson people used the stringy inner bark to make twine, the Shuswap people used it for rope, and the Nisga'a for mats. Douglas maple is suitable as an ornamental and is particularly attractive in the autumn. Glabrum means "smooth," perhaps referring to the leaves or fruit, which have no hairs.